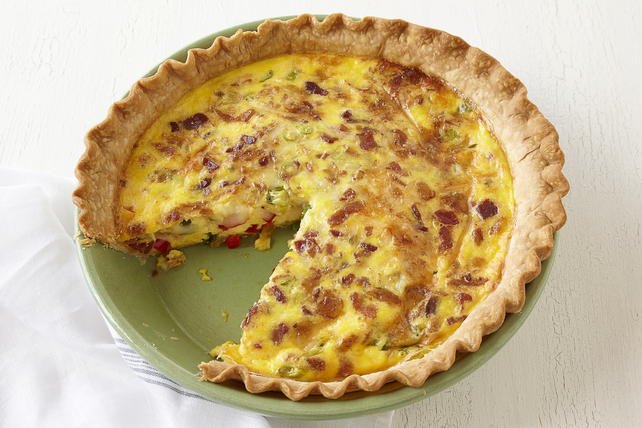 Here’s a quiche recipe that’s ideal for a weekend brunch or simple dinner. Prick bottom and side of pie crust with fork. Bake 8 min. or until lightly browned. Meanwhile, cook peppers in skillet sprayed with cooking spray on medium heat 5 min. or until crisp-tender, stirring occasionally. Reduce oven temperature to 375°F. Spread peppers onto bottom of pie crust; top with onions, cheese and bacon pieces. Whisk remaining ingredients until blended; pour over ingredients in pie crust. Place on rimmed baking sheet. Bake 50 min. or until knife inserted in centre comes out clean and top is golden brown. Let stand 10 min. before cutting to serve. Serve with a crisp green salad tossed with your favourite Kraft Calorie-Wise Dressing.